Lost your pucks? The ones that came with your air hockey table invariably go missing after a few months, don't they? But don't despair, we have replacement air hockey pucks available. They come in 3 sizes. 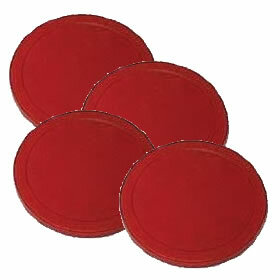 These are 63mm diameter (red) for some smaller BCE tables. These air hockey pucks come in packs of 4. We also have the larger pucks for the larger tables.